This illustration shows a cholesteatoma impinging on the malleus and the incus of the middle ear. The most common reason for a cholesteatoma is a poorly functioning Eustachian tube, the canal that connects the middle ear to an area behind the nose. It is responsible for equilibrating middle ear pressure to pressure in the external environment. This tube is normally collapsed in its resting state and with swallowing or yawning, the muscles around the tube contract and cause the tube to open, allowing the influx of air into the middle ear space. When this tube does not work properly, a relative negative middle ear pressure is generated and maintained. Over time, the weakest part of the eardrum begins to retract (sink) back into the middle ear. Eventually, a skin-lined sac forms and continues to grow. When these dead cells and keratin accumulate in the middle ear and cannot be expelled, an infection occurs with intermittent drainage from the ear. As this ball of dead cells accumulates, it produces enzymes which cause the destruction of bone. The hearing loss occurs as a result of destruction of the ossicles (bones) in the middle ear in the same fashion. B: Sigmoid Sinus vein. Cholesteatoma here can cause: thrombophlebitis, intracranial hypertension, abducens nerve paresis, diplopia. C. Semicircular canals. Cholesteatoma here can cause: dizziness, vertigo. D. Facial nerve. Cholesteatoma here can cause: facial paralysis, facial hyperkinesis. In addition, a perforation (hole) of the eardrum can provide a pathway for skin of the eardrum to enter the middle ear. 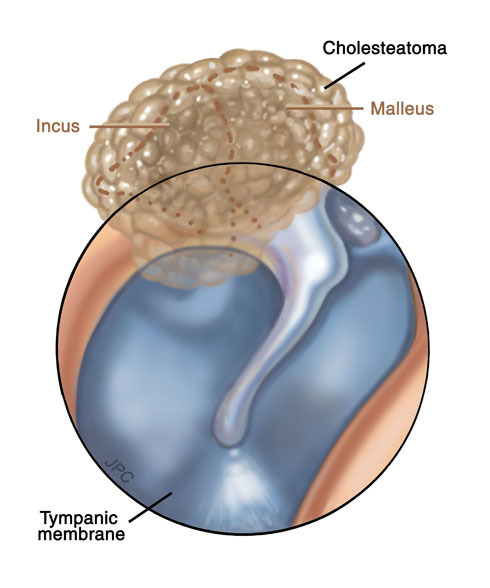 Once in the middle ear, the cholesteatoma can grow along the undersurface of the eardrum, envelop the ossicles (bones) of the middle ear, and erode the bony covering of the facial nerve and brain. 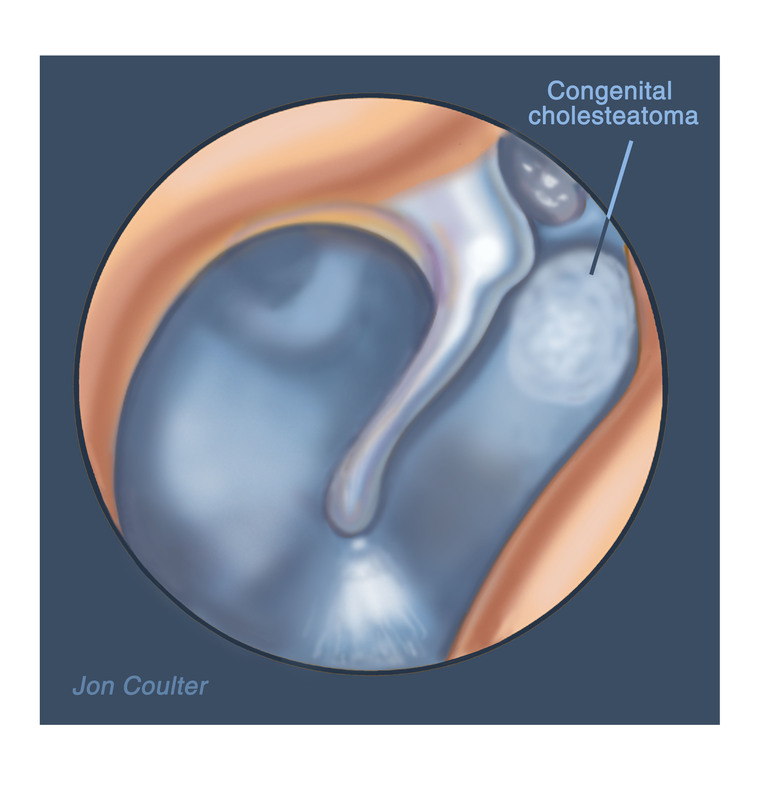 A congenital cholesteatoma is seen through an intact tympanic membrane (ear drum). Lastly, some patients are born with small remnants of skin that become entrapped within the middle ear (congenital cholesteatoma) or petrous apex (petrous apex epidermoid) during development.